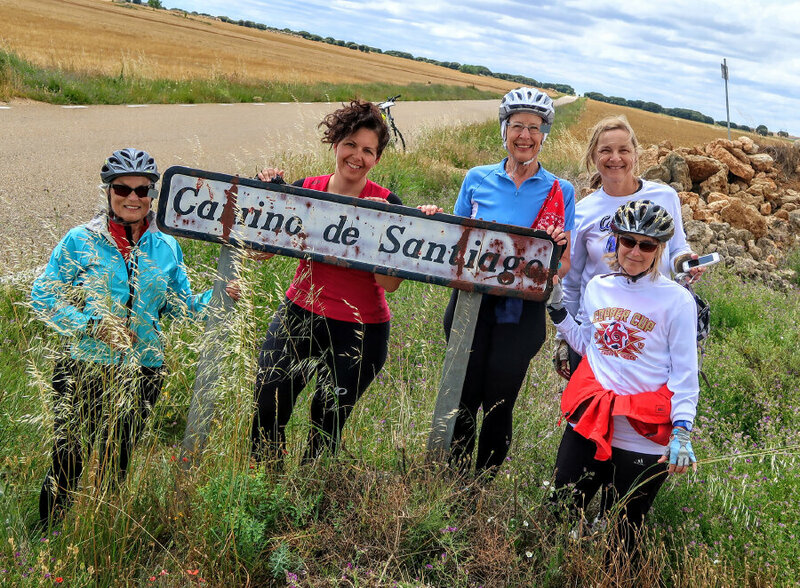 The Camino de Santiago, or the Way of St. James, or just The Way, has been a pilgrimage for millions of people for more than a thousand years. Ever since the remains of St. James the Apostle were said to have been found here in 813AD, pilgrims have made their way to the sanctuary at Santiago de Compostela in northern Spain. 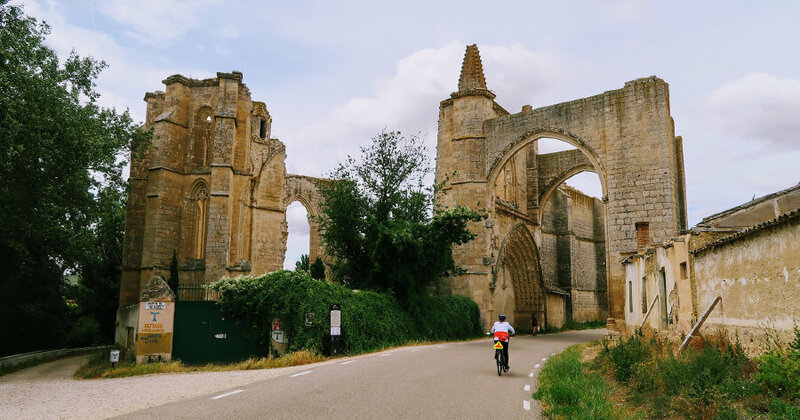 Come with us as we follow this extraordinary path by bicycle, feeling the weight of history increase every day as we approach our destination. 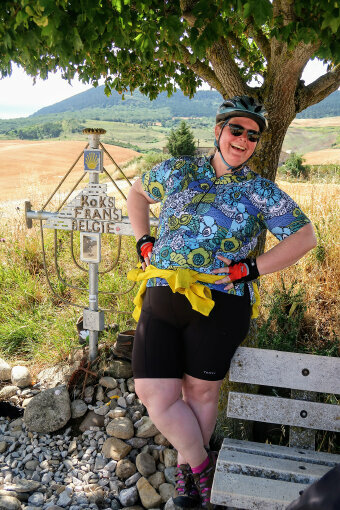 7 nights lodging, 7 breakfasts, 3 lunches, 5 dinners, snacks, van support, hybrid bicycle, detailed route cues and maps, and trained bilingual guides. Fly round-trip to Madrid, Spain. Then take the train to León. At the end of the tour, fly back to Madrid for your return home. Fabulous tour! We were blessed with the best guides, best women group, perfect weather, incredible scenery, beautiful culture, exceptional food - what more can I say?! The pilgrims mass topped it off! DAY 1: We’ll meet at 4:30pm for a bicycle fitting in León. If you’re able to arrive earlier, take the time to visit the Pantheon of the Kings of León to see some of the finest Romanesque frescos in Spain. In contrast, be sure to check out the Casa Botine by modernist architect Antoni Gaudi in 1891. Many of his buildings are now UNESCO World Heritage Sites. When you’re done sightseeing, you can stroll through the narrow lanes of the Barrio Humido (humid quarter) named for the large number of colorful bars lining the streets. Before dinner tonight, we'll walk together to the stunning León Cathedral. More than half of its exterior walls are made of extraordinary stained glass, specifically built to filter light during different times of the day. There, we’ll pick up our pilgrim passports with our first stamps. We’ll collect stamps throughout the tour as proof of the places we’ve visited using our own power. 0 miles. DAY 2: We’ll head out after breakfast on our bicycles along the Orbigo River to the town of Astorga. You should see cabbages in the fields and hops on the vines along the way. It’s the animated clock tower in the main square that will captivate you. If you’re a Gaudi fan, you’ll see another one of his creations – the Episcopal Palace – in Astorga too. 37 miles. DAY 3: We leave the Maragateria region behind and head into Galicia today. 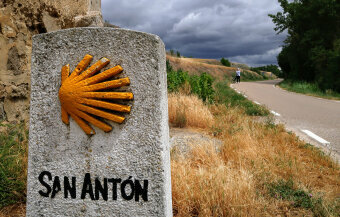 It is here where you’ll really feel the Camino. We’ll cycle through tiny villages virtually unchanged since the Middle Ages. 47 miles. 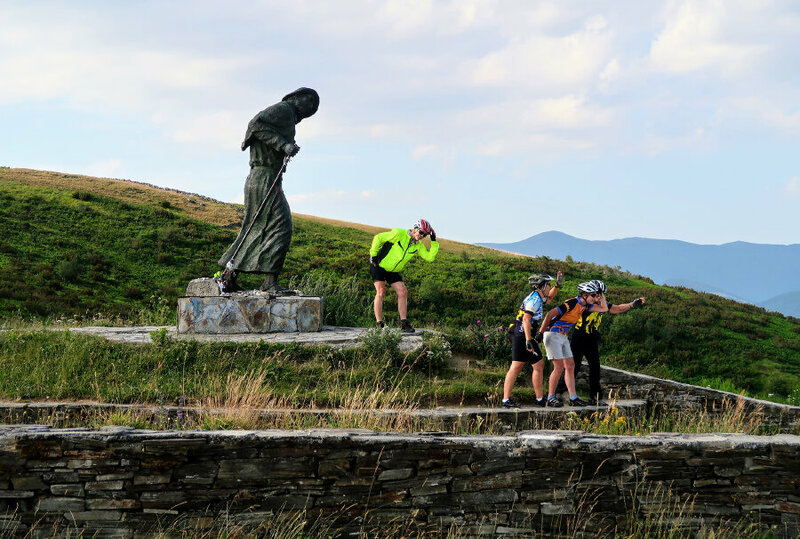 DAY 4: Our most challenging climbing of the tour occurs today as we cross the Galicia Mountains. Many pilgrims unburden themselves by leaving a stone they’ve carried on the Camino at the Iron Cross, marking the highest point of the journey. We stop just over the pass in the tiny hamlet of O Cebreiro. You may remember seeing the charming thatch roofed stone houses here in Martin Sheen’s movie “The Way.” 19 miles. DAY 5: After a hearty breakfast, we descend into lush countryside, stopping in the town of Molinesca for a swim in the river. 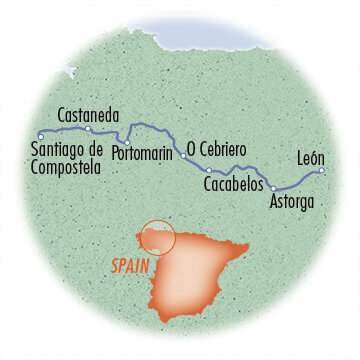 We’ll also pass through the town of Sarria where many other pilgrims often join our route. 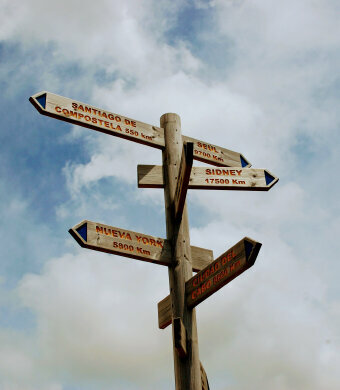 Sarria is about 100k from Santiago de Compostela which is the minimum that can be walked to get a certificate. We’ll overnight at a hotel overlooking the Miño River in Portomarin. 43 miles. DAY 6: We cycle through rolling farmland today where little has changed in centuries. Inheritance laws have required farms to be divided among the heirs, so they’ve become smaller over time – too small for machinery. Farming is still done the same way as it has been for generations. We’ll pass the town of Castaneda, which was once the site of furnaces that produced lime. Pilgrims carried stones from nearby quarries to the furnaces to help construct the Cathedral of Santiago de Compostela where we're headed. 35 miles. DAY 7: The excitement in the air will be palpable today as we make our final way to Santiago de Compostela. We’ll cross a river where pilgrims were once forced to undress and bathe in order to be clean “for the love of the Apostle.” We’ll catch our first glimpse of the spires of the cathedral just beyond this spot. Then we’ll cycle beside the walking pilgrims as hundreds of us stream toward the grandiose cathedral. We can feel the Tree of Jesse, touch heads with Master Meteo, embrace the silver bust of St. James and then kneel before the small casket with his remains. Our journey is complete. You can take your passport filled with stamps to the side of the cathedral for your certificate. We’ll celebrate our accomplishment at dinner together tonight. If your departure plans allow, try to attend the special daily pilgrim mass tomorrow at noon. 31 miles. DAY 8: The tour ends today and we’ll say good-bye, knowing that our trek is now part of history. You’re free to take a 20-minute taxi to the airport or train station to head home. 0 miles.